The official flag of the state of Maryland consists of the 17th century heraldic banner with the colors and shield from the coat of arms of the Calvert-Crossland families of Sir George Calvert, the first Lord Baltimore (1579–1632). The flag was officially adopted by the General Assembly of Maryland ( state legislature) in 1904. The first Maryland flag design consisted of the seal of Maryland on a blue background,  similar to many other state flags. The black and gold design on the flag is the coat of arms from the Calvert line. It was granted to George Calvert as a reward for his storming a fortification during a battle (the vertical bars approximate the bars of the palisade). [ citation needed] The red and white design is the coat of arms of the Crossland family from South Crosland in West Yorkshire in England, the family of Lord Baltimore's mother, and features a cross bottony with the red and white sides of the cross alternating. Since George Calvert's mother was an heiress, he was entitled to use both coats of arms in his banner. It is one of only four U.S. state flags that does not contain the color blue (the other three being Alabama, California, and New Mexico). It is also the only US state flag to be directly based on English heraldry, although the flag of Washington, D.C., is a modification of the coat of arms of George Washington's family. The heraldic blazon is: Quarterly, 1st and 4th, paly of six Or and Sable, a bend counterchanged (for Calvert); 2nd and 3rd, quarterly argent and gules, a cross bottony counterchanged (for Crossland). Section 7-202 of the General Provisions Article of the Annotated Code of Maryland provides: "(a) The State flag is divided into quarters. (b) The first and fourth quarters are a paly of six pieces, or (gold) and sable (black), and a bend dexter (right diagonal band) counterchanged so that they consist of six alternating gold and black vertical bars with a diagonal band on which the colors are reversed. (c) The second and third quarters are quartered argent (white) and gules (red), a cross bottony counterchanged so that they consist of a quartered field of white and red, charged with a Greek cross that has arms terminating in trefoils and opposite coloring so that red is on the white quarters and white is on the red quarters, as represented on the escutcheon of the State seal." Maryland is the only state in the union that has a specific guideline not only on how to display the flag but on what the flagpole should look like as well. In 1945, the Maryland General Assembly made a gold cross bottony the official ornament for the top of any flagpole carrying the state flag. Sometime before October 10, 2007, Government House (the governor's mansion) in Annapolis ceased to display the cross bottony at the top of the flag pole, but the flags at the State House continue to do so (adhering to Maryland General Provisions Code § 7-202 & 7-203 (2016)). In March 2015, the gold cross botonee was put back on top of the flag pole on Government House (Governor’s Mansion). All other state government buildings, including public schools, obey this guideline, but many private individuals and businesses do not. The Calvert and Crossland coats of arms, and the flag itself have been adapted for use in various ways across the state. Beginning on September 9, 2008, the University of Maryland painted both end zones at Maryland Stadium with the flag's two patterns. Some Maryland counties and municipalities have arms and/or flags incorporating various elements of the arms, including the city of Baltimore, as well as Calvert, Caroline, Baltimore, Howard, and Worcester counties. The University of Maryland, College Park athletic teams have long used the colors of the state flag. All four colors from the flag are currently used, with the primary colors being red and white, with black and gold used as accent colors. The Maryland flag is also displayed on the right shoulder of the football uniforms. At the start of the 2011 football season, the team unveiled a new uniform designed by Baltimore-based sportswear company Under Armour combining both parts of the flag. Similarly, the men's lacrosse team features designs from the flag on the jersey shoulders. The end zones of Maryland Stadium are often decorated in a Maryland flag motif, and the state flag is run onto the field during almost all the athletic games. The University of Maryland, Baltimore County (UMBC), also in the University System of Maryland, uses all four colors in its main logo. The shield of Loyola University Maryland (formerly Loyola College) utilizes both the Calvert shield in its upper-left quadrant, as well as a stylized red and yellow quadrant, symbolic of the Maryland state flag. The Baltimore Dragon Boat Club features the flag motif in its logo. The seal of Johns Hopkins University in Baltimore features the same design and colors as the Maryland flag. The Johns Hopkins colors are sable and gold, taken from the Calvert coat of arms (though the athletic colors are blue and white, as the school mascot is the blue jay). The secondary logo of the Baltimore Ravens professional football team in the National Football League is a shield with alternating Calvert and Crossland Banners interlocked with a stylized "B" and "R". Starting with the 2009 season, the Baltimore Orioles major league baseball club has added a patch to the left arm of their uniforms that features a round version of the Maryland flag. The gold and black Calvert coat of arms and red and white Crossland coat of arms are featured in the seal of the town of Ferryland, Newfoundland, the present-day site of Calvert's Colony of Avalon. Goucher College incorporates the flag in its seal. Many popular culture items feature the flag's design. Car bumper stickers decorated with the flag are seen on the windshields of cars and many other designs also feature the flag. Shorts, shirts, keychains, and many other items are sold in Maryland and worn by people living in or from the state. The flag of the short-lived Republic of Maryland—a state established by the Maryland State Colonization Society to "repatriate" freed slaves in Africa—also used Calvert's black and yellow. The school colors of Calvert School, an independent school in Baltimore City, are black and gold. Maryland based company Under Armour released a line of cleats in 2017, with the Crossland coat of arms design incorporated into the cleats. Under Armour bags also incorporate the flag in its design starting in late 2015 and is seen at its outlet mall locations. ^ Callaham, Art. "The nitty-gritty of Maryland's state flag". HeraldMail. ^ a b c d Maryland State Flag History (Maryland Secretary of State.) Retrieved August 29, 2012. ^ Beaujon, Andrew (19 August 2015). "Maryland's Flag Has a Subtle Symbol of Confederate Sympathy". Washingtonian. Retrieved 3 August 2017. ^ Kaye, Edward B. " Good Flag, Bad Flag, and the Great NAVA Flag Survey of 2001". Raven: A Journal of Vexillology. 8. 2001. p. 11-38. Archived from the original on February 23, 2015. ^ "The Maryland State Flag". Secretary of State. Retrieved 3 August 2017. ^ Meredith Cohn (June 15, 2005). "Southwest paints Boeing 737 with Maryland flag theme". Baltimore Sun. ^ "Maryland". 15q.net. Retrieved 5 June 2015. ^ Rachel Siegel (August 11, 2017). "A Maryland man found a hobby making armor. Now he's using the same materials to make a one-of-a-kind state flag". Washington Post. ^ "Hello Internet". Hello Internet. Retrieved 2018-12-23. 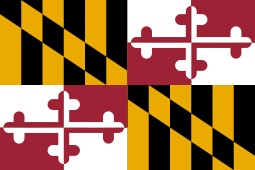 Wikimedia Commons has media related to Flags of Maryland.